One of the strangest things that I have noticed is that people talk more about the Mark of the Beast than the Mark of God. Many do not know that God has a Mark that identifies His people and that this mark is vital for their salvation. The Bible says, "Set a mark upon the foreheads of the men that sigh and that cry for all the abominations that be done in the midst thereof. Slay utterly old and young, both maids, and little children, and women: but come not near any man upon whom is the mark; and begin at my sanctuary" (Ezekiel 9:4, 6). Friends, instead of being concerned about the Mark of the Beast, we should be more concerned about having the Mark of God. 1. 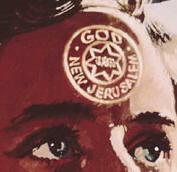 Where will God's seal be placed? “Hurt not the earth, neither the sea, nor the trees, till we have sealed the servants of our God in their _________,” (Revelation 7:3). 2. What does the seal stand for? “Nevertheless the foundation of God standeth sure, having this seal, The Lord knoweth them that are his. And, Let every one that nameth the name of Christ ________ from __________,” (2 Timothy 2:19). NOTE: The mark stands for those who have departed from iniquity and sin. We must never forget that Jesus is returning for those who do the will of the Father. A legal seal gives the name of person issuing the seal, his title and the territory where the law applies. In ancient times, kings would affix their mark or seal upon a document to make it legal. 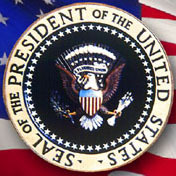 In the United States, the president affixes his name and the U.S. Seal unto a Bill to make it law. 3. 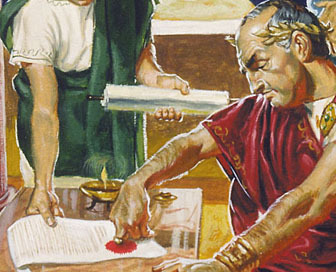 How did King Ahasuerus authenticate a decree for the Jews? “Write ye also for the Jews, as it liketh you, in the king’s name, and ______ it with the king’s ring: for the writing which is written in the king’s name, and sealed with the king’s ring, may no man reverse,” (Esther 8:8). 4. Does God attach His seal to His law? “Bind up the testimony, ______ the _____ among my disciples,” (Isaiah 8:16). 5. What is the relationship between sign and seal in the Bible? “And he received the sign of circumcision, a seal of the righteousness of the faith which he had yet being uncircumcised: that he might be the father of all them that believe, though they be not circumcised; that righteousness might be imputed unto them also,” (Romans 4:11). NOTE: Sign and Seal are synonymous, they mean the same thing. 6. WHAT IS GOD'S LAW? "And the LORD said unto Moses, Come up to me into the mount, and be there: and I will give thee tables of stone, and a law, and _____________ which I have written; that thou mayest teach them," (Exodus 24:12). NOTE: The Ten Commandments are God's Law. Read carefully each commandment and find where God has attached His seal (His name, title and territory). Ten Commandments Exodus 20:3-17. 7. 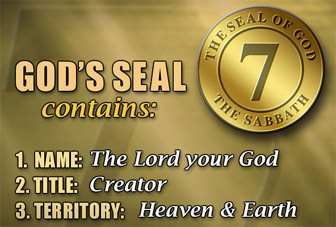 Which commandment meets the criteria of a seal: Name, Title, and Territory? “Remember the Sabbath day, to keep it holy. Six days shalt thou labour, and do all thy work: But the seventh day is the Sabbath of the ______ thy God: in it thou shalt not do any work, thou, nor thy son, nor thy daughter, thy manservant, nor thy maidservant, nor thy cattle, nor thy stranger that is within thy gates: For in six days the LORD made ________ and ________, the ____, and all that in them is, and rested the seventh day: wherefore the LORD blessed the Sabbath day, and hallowed it," (Exodus 20:8-11). NOTE: The fourth commandment meets all of the requirements. 8. Does the Bible call the Sabbath God's sign or seal? “Speak thou also unto the children of Israel, saying, Verily my ___________ ye shall keep: for it is a _____ between me and you throughout your generations; that ye may know that I am the LORD that doth sanctify you," (Exodus 31:13). "Moreover also I gave them my __________, to be a _____ between me and them, that they might know that I am the LORD that sanctify them," (Ezekiel 20:12). 9. How does someone acknowledge that he belongs to God's kingdom? 10. What three things did God confer upon His Sabbath Seal? “And on the seventh day God ended his work which he had made; and he _______ on the seventh day from all his work which he had made. And God ________ the seventh day, and ____________ it: because that in it he had rested from all his work which God created and made,” (Genesis 2:2, 3). NOTE: In His resting and blessing of the seventh day Sabbath, God assured a special rest and blessing to all who would keep it. In His act of sanctifying it, He set it apart for holy use. 11. What special blessing is assured to those who keep the Sabbath? “It is a sign between me and the children of Israel for ever: for in six days the LORD made heaven and earth, and on the seventh day he rested, and was ___________,” (Exodus 31:17). 12. Can the blessing be transferred to another day? “God is not a man, that he should lie; neither the son of man, that he should repent: hath he said, and shall he not do it? or hath he spoken, and shall he not make it good? Behold, I have received commandment to bless: and he hath blessed; and I ________ _________ it,” (Numbers 23:19, 20). 13. Does the Sabbath blessing ever end? “Now therefore let it please thee to bless the house of thy servant, that it may be before thee for ever: for thou blessest, O LORD, and it shall be _________ ___ ______,” (1 Chron. 17:27). 14. Do you understand that the seventh day Sabbath meets the criteria for God's seal and that His remnant people will have this sign? 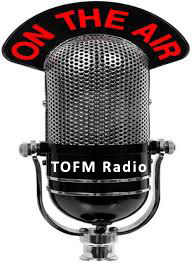 © Copyright 2000/2013 - David M. Ephraim, Touch of Faith Ministry. All Rights Reserved.